Professor S. Raghavan (BMGT/ISR) has written an article for the INFORMS magazine OR/MS Today’s annual special issue on innovative education. 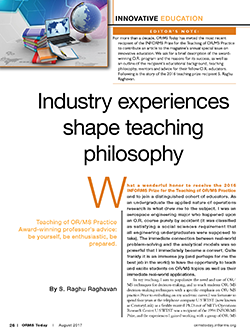 The magazine invites all recipients of the INFORMS Prize for the Teaching of the OR/MS Practice to contribute an article to innovative education issue. Raghavan won the prize in 2016. The annual teaching prize is given to a faculty member for excellence in teaching the practice of operations research and management science. The purpose of the award is to recognize a teacher who has succeeded in helping his or her students acquire the knowledge and skills necessary to be effective practitioners of operations research or the management sciences. You can read ISR’s original story about Raghavan’s award here. INFORMS is the Institute of Operations Research and Management Sciences. It is the professional society for operations research and management science (OR/MS). ---ISR is grateful to INFORMS and OR/MS Today for permission to share Dr. Raghavan's article via this PDF.